CHENNAI: “When was the last time you drank tap water in Chennai?” writer and environmentalist Nanditha Krishna asked the gathering at Kalakshetra Foundation for the three-day Chennai Water Forum. “When was the last time you bathed in the Marina?” she went on. “I’ve done all of this and that is the Madras we have lost,” she sighed. The British put a price of `25 for the head of a tiger or leopard, driving the ‘natives’ to decimate the animals systematically for the prize money. For a tiger to call a place its home, water was essential since the tiger’s usual habitats were swamps and wetlands, Nanditha said. So how did the scrub jungles we are living in today take its place? Nanditha explained that Cooum, whose name was derived from ‘Coovalan’, meaning Hydrologist in Tamil was one of the two fresh water lakes, rare in Southern India since the region was considered mostly dependent on rainfall. The 65-km long river had ancient Shiva temples along its banks where it had been recorded that a dip in the Cooum was equivalent to a dip in the Ganga “Today, I would advise against both,” said Nandhitha. 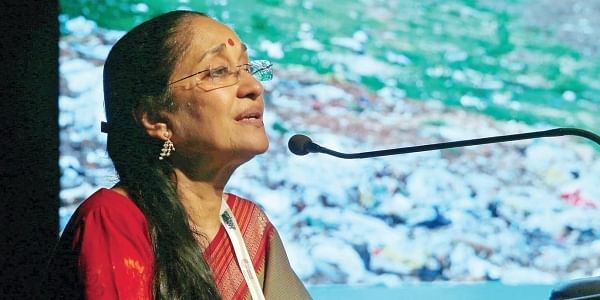 The pollution today, Nanditha said, comes not from slums but from some of the city’s elite: Indian Institute of Technology and the Cancer Institute. As parts of the city transformed from the paradise it once was to urban dumps, so did their names. The name ‘Chrompet’ that was once Nagalkeni was an insult to the place, according to her. She believes that the new name has come from the high levels of chromium in water of the area.